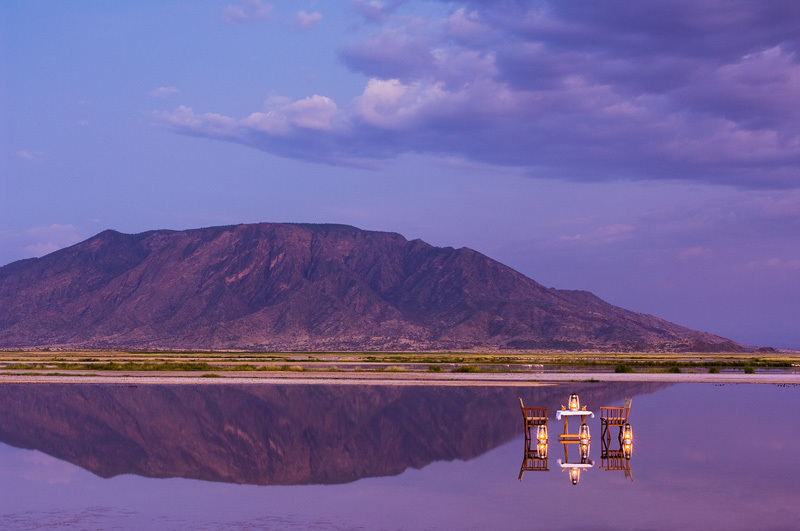 Lake Natron is a salt lake located in northern Tanzania, close to the Kenyan border, in the eastern branch of the East African Rift. It is quite shallow, less than three metres (9.8 ft) deep, and varies in width depending on its water level, which changes due to high levels of evaporation, leaving behind a mixture of salts and minerals called natron. Temperatures in the lake can reach 60 °C (140 °F), and depending on rainfall, the alkalinity can reach a pH of 9 to 10.5 (almost as alkaline as ammonia). I wanted to create something different from your typical sun downer shot, so I decided to have everything set up in the shallow water. Featured in our Wild Romance book.